Though Christmas decorations have become increasingly international in Italy over the past few decades, traditionally most Italian households, shops, and churches celebrated the season with a single, but often sprawling and elaborate, adornment: the Christmas Nativity scene, or presepe. If a basic set of figurines of the Holy Family and a small model stable to hold them comes to mind, think again. The presepe in Italy is usually an exquisitely detailed and densely populated miniature world, often including a small village with relative homes and workshops, the surrounding model countryside, its hills covered in shepherds tending their tiny flocks, and, in a central place of honor, the humble stable hosting the holy event. 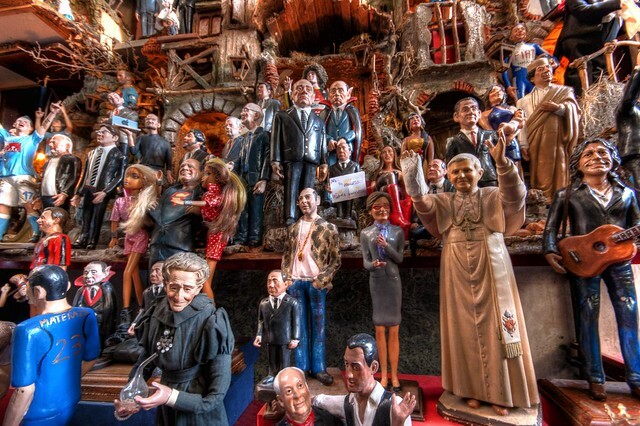 See just how elaborate the Italian Christmas Nativity scene can become by visiting Via San Gregorio Armeno in Naples. Click to tweet. Over the years, most presepi grow in size as figurines and accessories—crackling fires, tinkling fountains, miniature replicas of everything from home furnishings to sides of pork—are added each Christmas. Presepi sets get passed from generation to generation, and many of the scenes can grow to cover half a room as villages expand. The work of constructing the presepe scene and setting up the figurines traditionally happens on December 8th (the Feast Day of the Immaculate Conception), though some are so large and complex that they can take weeks to complete. To get an idea of just how elaborate a nativity scene can become—and how serious many Italians are about this holiday tradition—take a stroll down Via San Gregorio Armeno in the historic center of Naples, a city where the presepe is particularly beloved and artistic. This narrow pedestrian street, typical of Naples’ older neighborhoods, is lined with tiny workshops stuffed with figurines and accessories for presepi scenes. The better-quality terracotta figures are hand-molded and painted—though more economical and mass-produced plastic statuettes can also be found--and range from plucky street urchins to flushed artisans, from burly housewives to richly-costumed Magi. Each year, limited edition figurines are also offered, inspired by the latest events in politics, pop culture, and sports...don’t be surprised to spot presepi hosting miniature Berlusconis, rock stars, or—this year in particular—Pope Francesco. The evolution of this street (known to locals as Via Liguoro) and its specialty production is fascinating: in Roman times, a temple dedicated to Ceres—goddess of agriculture and fertility—was located here, and citizens would purchase small terracotta statuettes from the nearby workshops to leave as ex voto offerings. Over the centuries, the production gradually changed shape and subject, and by the late 1700s became the Nativity scene figurines still crafted and sold today. The modern tradition of elaborate Nativity scenes in Italy has roots in the 1700s, when the first was commissioned by the King of Naples. Click to tweet. The modern tradition of elaborate presepe scenes has roots in the 18th century, when Charles III, King of Naples, commissioned a Nativity scene which included not just the Holy Family, but scenes and personages from everyday life. Thus, the first figurines representing everyone from commoners going about their everyday business to the royal family (it was the King who had to foot the bill, after all) were displayed, and a new Christmas tradition was born. You can see this first elaborate presepe displayed at the Church of Saints Cosma and Damiano in Rome, but you don’t need to travel that far from Naples to see some of the most breathtaking Nativity scenes of the season. 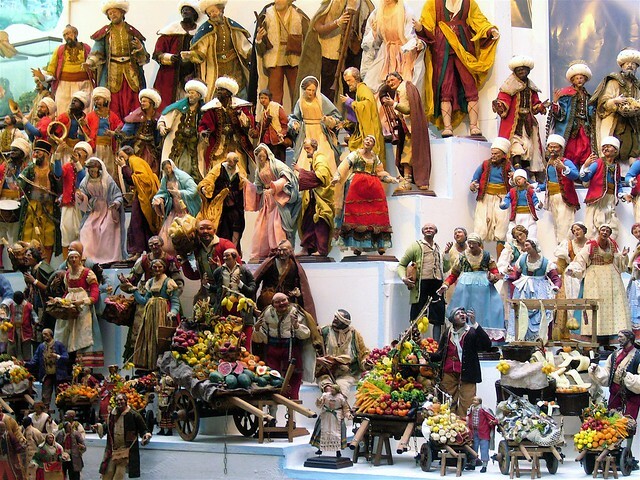 Naples is the presepe center of Italy, and in most churches (and many shops and piazze) a large yet tiny Christmas world takes center stage, adding the tiny baby Jesus on the night of the 24th and reaching completion with the arrival of the three magi on January 6th.